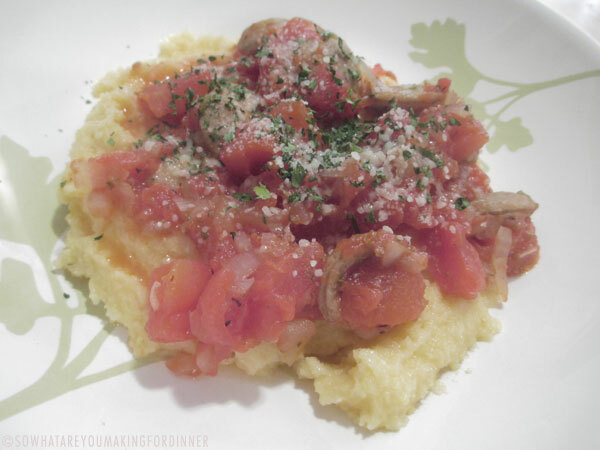 This recipe had me at Parmesan Polenta. I found this on MyRecipe.com. I prepared the Sausage portion of this on Sunday. Tonight when I got home tonight I made the polenta. I love instant polenta! This recipe was originally from Cooking Light, that makes it even better. Heat a medium saucepan over medium-high heat. Add oil to pan, swirling to coat. Add sausage; sauté for 3 minutes or until browned. Add onion; sauté for 5 minutes or until tender. Add garlic; sauté 30 seconds. Add oregano, pepper, and tomatoes; bring to a boil. Reduce heat, and simmer 15 minutes, stirring occasionally. Add 1/4 cup basil to pan; cook 5 minutes or until sauce thickens. Combine broth and water in a large saucepan; bring to a boil. Add polenta; reduce heat, and simmer 5 minutes or until thick, stirring frequently with a whisk. Stir in half of cheese. Place 2/3 cup polenta in each of 4 bowls; top with about 3/4 cup sauce. Top each serving with 1 tablespoon basil and 1 tablespoon cheese. As you all know there was a devastating tornado that touched down in Oklahoma yesterday. If you can help these people who now have nothing here is a link a for Midwest Tornado Relief Fund. 100% of your donation goes to the victims. And anyone who follows of this blog knows I have a soft spot for animals. This is such a touching video of a woman who finds her dog during an interview. As she is speaking take a look around at the destruction that is surrounding her.